A simple, easy-to-use, 1/4" jack to USB audio interface cable for your guitar or bass. StealthPlug is the first audio interface for guitar and bass integrated into a simple, miniaturized, 1/4" jack to USB cable with full input/output processing for your PC or Mac. It's so easy to use that you will be able to plug it into your computer as you would plug into an amplifier. Be ready to rock in seconds and enter the world of software-based amp/effects modeling and recording. StealthPlug includes the new, easy-to-use, award-winning AmpliTube 2 Live standalone and plug-in for your favorite recording software. Fully MIDI-controllable, it has 5 guitar and bass amp combinations of the most sought after gear, 11 effects, mic-modeling with 2 microphones and position controls, a built-in tuner, and more than 128 customizable user presets. Plus, the standalone version also offers the new SpeedTrainer, an integrated audio player with pitch and speed control for playing with or learning your favorite songs. 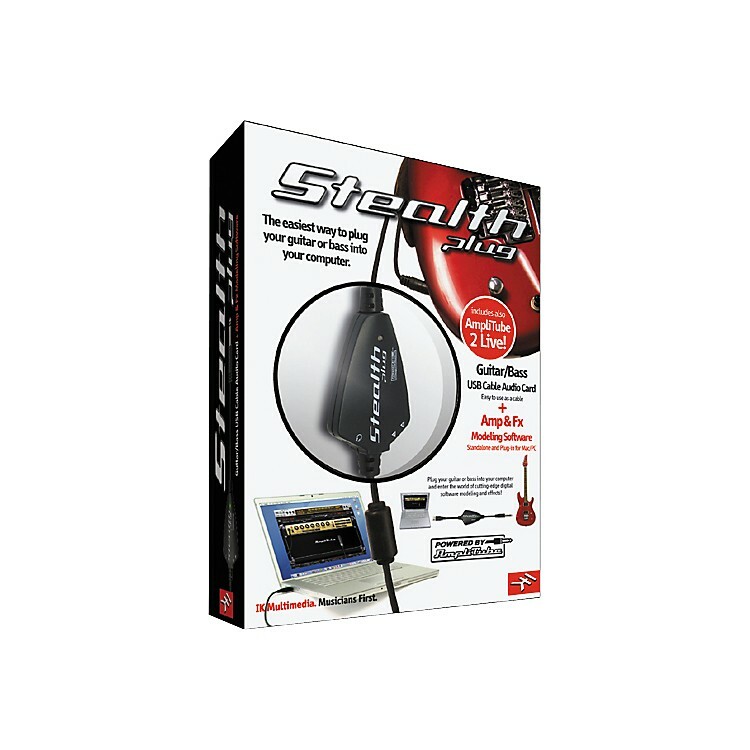 4 additional software and sound packages bundled with the StealthPlug make it one of the most affordable and complete hardware/software solution for playing, practicing, and recording on the market. First there's Tracktion 2.1 by Mackie which allows you to compose and record with a full audio/MIDI sequencer. Secondly you can fine tune your work with IK's acclaimed T-RackS 6-band mastering EQ. The third bundled item is IK's SampleTank 2 SE sound workstation and its 64 sounds which let you write and arrange your MIDI tracks. Last, but not least, you get a staggering 500MB of Sonic Reality loops with guitar, bass, and drum loops for you to use within your songs or play along with. Moreover, you will also be eligible for upgrades/crossgrades to the the full versions of the included software and the entire IK range at highly reduced prices, making the StealthPlug a great value for any guitarist or bassist. StealthPlug users can now download for free AmpliTube X-GEAR, a completely expandable guitar amp and effects modeling software system available as a plug-in and standalone version for Mac/PC. It allows mixing and matching between all the gear models from all current and future "Powered by AmpliTube" products in a single host interface; providing seamless control over every parameter directly from IK's StompIO USB floor controller and audio interface. X-GEAR gives users the ability to build the ultimate mega-rig of truly custom guitar and bass tones, live and in the studio.